The Sassanids are almost here..! A subtle revision of FoGR Renaissance is in the offing, and to help test the rules the Kings Capital in Oxford is besieged by eager gamers all keen to raise the standard for King or for Parliament! What will happen in an event where in previous year's I've taken Parliamentarians and Scots? Why, it's One for All and all for The King!, as we shop at the Waitrose of Life, not the Lidl of Despair for 3 FoGR reports! A Bank holiday weekend and a mixed forecast meant I accelerated the basing and finishing of the Sassanid ADLG army in order to take advantage of the warm dry weather for dullcote-ing the troops. Normally I like to add the static grass before matt varnishing, but in this case the weather was just too good to miss, so here are the "before" and "after" dullcote shots for your delectation. Essex Ghaznavid infantry stand in - as I am sure they do for many wargamers - as Dailami infantry. I have added a couple of random arab-looking archers to the 40x40 base so they can have integral support (a nice-to-have in ADLG if you have spare points). The Legio Heroica infantry command with Irregular mounted command. The shield ended up a bit 'FC Barcelona', but that's still pretty cool, right? Very simple sun-themed banners. No LBMS transfers for me today, more's the pity! I have used some new colour palettes for these troops, in particular Vallejo ESMERALDA (071) and MAGENTA (042) together with Army Painter Hydra Turquoise. I've never used such vibrant colours before but for this army they do sort of work. I went with different schemes on all of the Clibanarii - they are nobles after all. I might go back later and add more design to the Generals horse barding. Banners and pennants are another thing I'm still considering...probably out of metal foil. Two types of LH from 2 manufacturers - Legio Heroica and Irregular. The Irregular ones can be javelin or bow armed as they have both. With the 28mm Goths mostly out of the way now (apart from two dozen cavalry...oops!) these 15mm Sassanid Persians have made it to the top of the pile again after a bit of a hiatus. The 9 bases of Clibanarii are now all painted and varnished, just needing to be based and the elephants are on their way too. The Levy spearmen/horde/mob are going to be in 3 ranks so they can appear either as Mediocre Spear or as a Mob. Donnington elephants in the background - Irregular Levy. 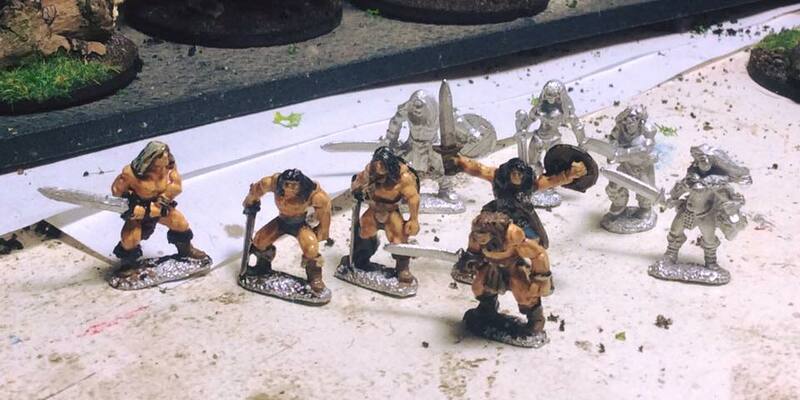 Having acquired a pack of Copplestone Barbarian Heroes earlier this year in a complex shipping and exchange rate transaction involving a man known by many as the scourge of TMP, and which, fortunately, has yet to be drawn into the "Car Wash" scandal engulfing much of Brazil, I have finally gotten round to painting the figures and sneaking them into various 'proper' barbarian battle lines. Two more now fight alongside the Vikings and Rus, as legendary "Northmen" - my theory being that what we recreate on the tabletop is as much based on first hand reports turned into the stuff of legend by retelling over the years - and we're also recreating cool films too - so why not! Isn't that a Massive Chopper? The much-trailed Gothic/Germanic/Viking/Barbarian army that has been on the painting table for the last year got a near-full outing tonight against some old-school Hinchcliffe Byzantines. Not much shooting taking place now - everyone is in combat! The last Byzantine archer unit falls - an inaugural victory for the Lombards! .. from my Gripping Beast Plastic Late Romans still lying around, I decided it was a good time to add a 25mm "Heroic" Commander to my Late Roman 15mm armies... and here's the evidence. He is clearly somewhat lacking the exuberance of his boss.. but he does have an LBMS transfer for his flag, so it's not all bad. Usual Army Painter technique with matt varnish to finish and a very light pale drybrush. Or from the front, making the standard bearer even more unhappy... and showing off the LBMS transfer on his bosses shield as well.